KirVonte Benson is finished for the season, Tech football coach Paul Johnson announced Tuesday. Benson suffered an injury during Saturday’s game against South Florida, a 49-38 loss, when Benson was struck in the knee by a USF defender during a carry. Johnson did not specify the nature of the injury, only calling it a knee injury and implying that it may not be related to Benson’s ACL, which Benson previously tore in high school. For the reeling Jackets, Benson’s injury represents a crucial loss. Benson had been named to the AP All-ACC preseason team this summer, and the season prior had finished No. 24 in the country and first in the ACC in yards per rush (minimum 200 rush attempts.) 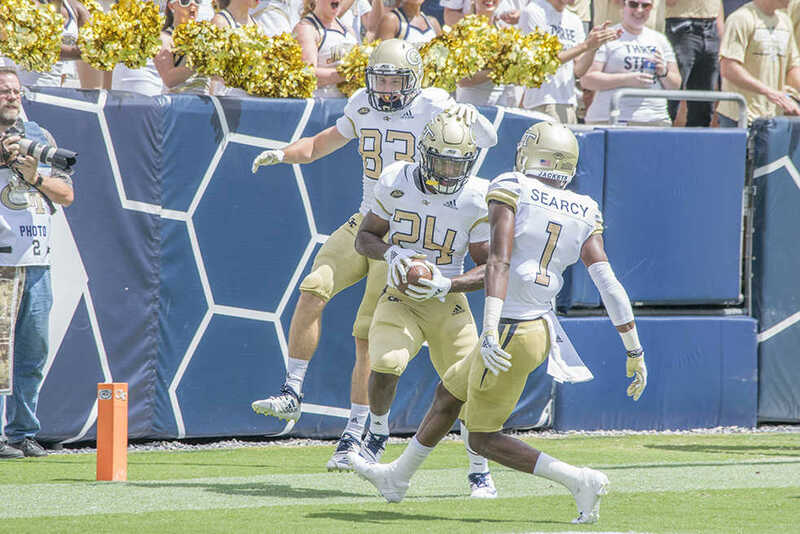 Benson was an explosive playmaker and a key part of the Jackets’ offense, and at the all-important B-back position, his loss hurts the Jackets deeply. Still, Tech is not without options. Redshirt freshman Jordan Mason stepped in and stepped up in Benson’s absence during the South Florida game and during Tech’s season opener against Alcorn State (the first quarter of which Benson was suspended for an unspecified infraction of team rules.) Mason has registered 180 rushing yards and averaged 7.5 yards per carry, 17th in the country among players with at least 20 rush attempts. If his words are to be believed, Mason is at least mentally ready to replace Benson. In an interview with the Atlanta Journal-Constitution (AJC) Wednesday, Mason said that while he had “a big spot to fill,” he realizes that he has “got to step up.” Mason, who graduated from Gallatin High School in Gallatin, Tenn. in 2017, recorded a jaw-dropping 2,048 yards in his high-school senior season while racking up 23 touchdowns. Mason profiles differently from Benson significantly; whereas Benson tends to use his size and speed to elude tacklers, Mason (who is larger than Benson) has shown a preference to using his strength to barrel through defenders. Mason also displayed a breakaway gear during a long touchdown against the Braves in the season opener, though it is unclear if he will be able to outrun conference opponents, which have much faster defenses. It is not uncommon for a player to look dominant against an FCS opponent and find himself unable to replicate that performance against more talented competition. There is supplemental depth at B-back behind Mason in the form of sophomore Jerry Howard, but Mason has proved himself as a capable starter at the position in a short time frame. It is unclear whether he can make himself valuable in the passing game and is somewhat of an unknown as a pass blocker, but in the Tech offense, neither of those characteristics ultimately matters very much. If Mason can protect the ball, move the chains in short-yardage situations and score in the redzone, he will be a perfectly workable replacement for Benson. The biggest question is, how quickly can QB TaQuon Marshall and Mason get in sync at the position? Marshall and Benson synergized well and entered the season as the driving forces behind the offense; now Marshall will have to adjust with his partner in crime out for the season.